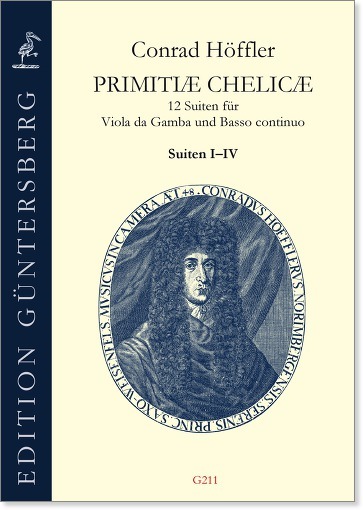 In the second half of the seventeenth century, there were four great viola da gambists in Germany: Johann Schenck, August Kühnel, Jakob Richmann, and Conrad Höffler. While the music of Schenck and Kühnel, at least, is widely known among viol players today, Höffler’s has largely gone unregarded. 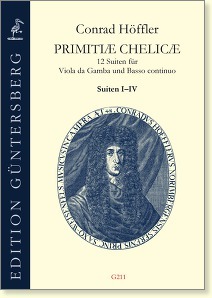 To alleviate this situation, Edition Güntersberg has published Höffler’s extensive Primitiæ Chelicæ , a collection of twelve suites for viola da gamba and continuo, in a new three-volume edition. The first volume features a detailed foreword, based on recent research, by viola da gambist Thomas Fritzsch. In terms of musical content and difficulty, the pieces are comparable to those of the other composers mentioned above, but clearly show Höffler’s own hallmarks.